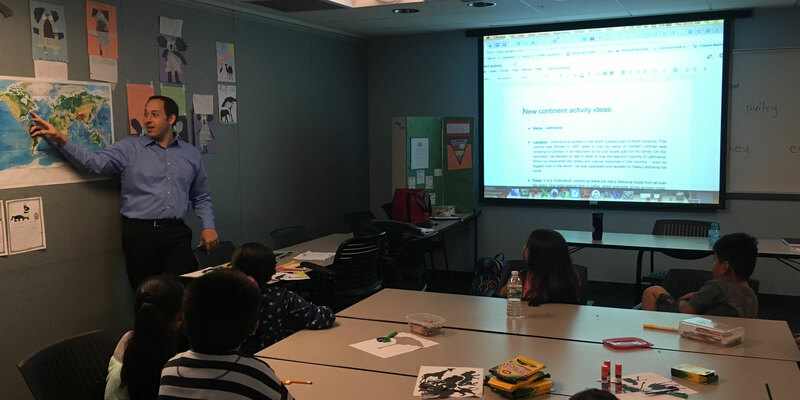 A summer reading camp program at Lehman College that concluded recently benefited a group of elementary and middle school students—and the teachers who helped them. For five weeks beginning in July, 32 students ages 5 to 14 from different Bronx public schools attended the camp on weekdays in Carman Hall, where they worked with teachers who are master’s degree candidates enrolled in the Graduate Program in Literacy Studies at Lehman’s School of Education. It was a win-win situation: the students were struggling readers in need of supplemental instruction to bring them to grade level and keep them there. At the camp, students received highly individualized lessons, with most of the instruction taking place in small groups of two students with one instructor during the daily three hour sessions. Larger groups of students worked collaboratively to improve their powers of observation and critical thinking, skills that will provide access to texts above present reading levels. Meanwhile, the instructors gained an important graduate credit, as their camp experience allowed them to complete a 700-level course, "Practicum in Fostering Language and Literacy Development," which is applicable to early and middle childhood and adolescent education. Their day at the camp was longer: after the students departed, the teachers continued to work on lesson plans, strategies, and problem solving while developing a fuller understanding of what literacy is. "With our support, the candidates were able to experiment with different ways of teaching literacy that they may have been hesitant before to try by themselves," said Prof. Jennifer Van Allen, program coordinator of literacy studies in Lehman’s Department of Counseling, Leadership, Literacy, and Special Education (CLLSE). "It takes time for teachers to feel comfortable outside of the box," added Prof. Diana Behan, a CLLSE adjunct and graduate from Lehman's Master of Education program in 1988, who is running the camp with Prof. Van Allen. "Here, they had the freedom to work on new approaches and share ideas with their peers throughout the five weeks they are together." A big part of increasing the reading skills for the students at the camp included involving them in different art and science projects connected to the texts. Some of their reading responses were posters that the students had created, as well as "passports" to the countries they were reading about, that hung from the classroom walls of the camp. The students had also crafted dioramas pertaining to the stories they were reading. At the end of camp the students presented to each other their final projects. The students also visited the children's section of the Leonard Lief Library during camp. Alison Lehner-Quam, the education librarian at Lehman, had developed a training guide that helped the master's candidates find appropriate books for different levels of readers. "The immersion aspect of this program is like a boot camp with a lot of support," said Marcella Koffler, a MS participant at the camp who received her M.Ed. from Lehman in 2017. "There are so many things to be included in teaching. Breaking it all down may seem simple, but it isn't. But what we realized from our professors here is that we can pull up new resources to use if one particular approach isn't working rather than slip into panic mode."